The guidance relates to the assessment, remediation and mitigation of the vapor intrusion pathway at contaminated sites in Wisconsin, for both chlorinated and petroleum substances. Among numerous updates, the new guidance incorporates the changes made to the Wisconsin Administrative Code ch. NR 700 in 2013. 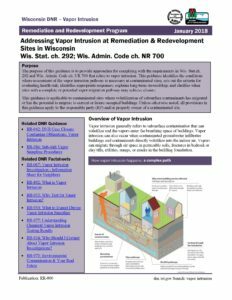 It also includes information found in the EPA’s 2015 vapor intrusion guidance documents, and it provides additional details on mitigation, including principles found in the American Association of Radon Scientists and Technologists (AARST) 2017 national standard on vapor mitigation, SCM-SF-2017). The RR-800 guidance was most recently updated in 2010. Questions or comments about the new guidance can be addressed to Alyssa Sellwood.